While you might not be able to see a camouflaged chameleon easily, he can see you regardless of whether you're in front of or behind him. His eyes are different from other eyes in the animal world in several ways, including his ability to see in more than one direction at a time without moving his head. At first glance, chameleon's eyes look unusual. Their shape is unique among animals, with no upper or lower eyelid. Instead, they have one big eyelid per eye that's shaped like a cone. It covers the eye nearly completely, leaving just enough opening to expose the pupil. Chameleons' eyelids are scaly, like their skin. A chameleon's eyes move almost like they're mounted on turrets -- separate turrets, since his eyes can move in different directions at once. This lets the chameleon search for prey on all sides, processing images from different directions simultaneously. His eyes have a full range of motion, pointing up, down, front, back and along each side independently of each other. When one of a chameleon's eyes spots a tasty insect, he turns his head to face his prey. This allows him to point both his eyes in the same direction, switching seamlessly to binocular vision. This is different than other animals with eyes on the sides of their head, such as deer, who have a narrow field of binocular vision -- just enough to keep from running into something in front of them. A chameleon uses binocular vision to increase his depth perception and aim to pinpoint accuracy as he shoots out his sticky tongue to catch the unsuspecting bug. 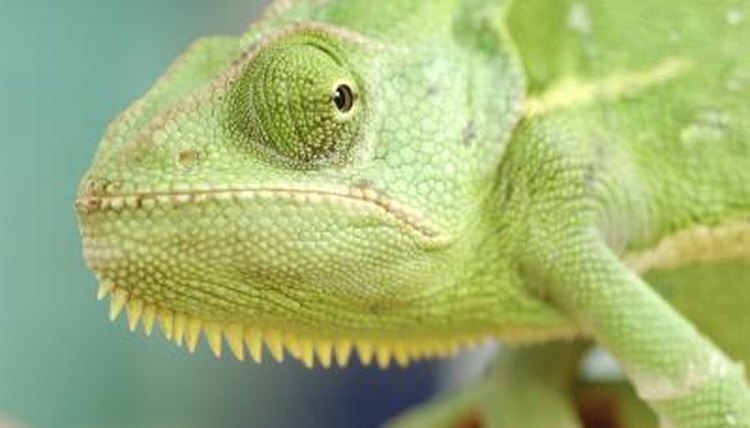 Chameleon eyes are unusual in the way they process light and focus on objects -- their eyes work almost like tiny telephoto camera lenses. Their eyes focus super fast, effectively zooming in on their targets for a closer look. Because of the shape of the lens in their eyes, chameleons can see a large and clear image of a target to help differentiate between food and non-food items.